It is almost impossible to imagine the advanced field on a dental industry that represents the implant systems which come as a restoration treatment of dental aesthetics and health. Most of the patients are not familiar with this procedure until they face this type of necessity for having optimal dental health. Sometimes, it is very difficult to make a proper decision because of the new and modern dental implants solutions the manufacturers offer to their dental professionals. 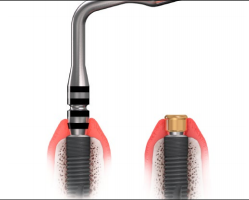 Patients, who are interested in gaining knowledge about dental implants, have the right to know that the abutment is a kind of connector between the denture and the implant which is inserted in the patient’s bone. There are so many different types of implant abutments which could be found on the market and each of them provides specific function while forming more individual approach to the right dental solution. Locator abutment is one of the previously mentioned abutment systems which provide a specific function in the field of dental implantology. It is specially designed to be used with partial dentures or overdentures which are supported partially or completely by dental implants. 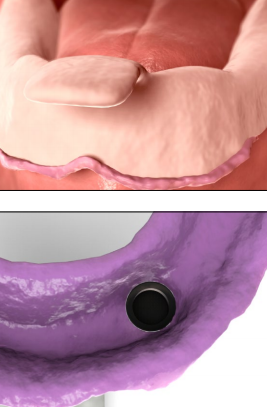 The most important feature of locator abutment is the fact that it could solve the problem with removable overdentures in a specific way and at the same time, provide secure attachment of the denture supported by dental implants. Locator abutment could be used for all types of complete dentures because of their low vertical height. They are a good choice because they offer dual retention, self-correcting alignment, and tolerance for the implant divergence. These types of attachments are used to stabilize the complete dentures in the last few decades. They represent an affordable solution for those patients who wear dentures to improve their chewing quality and also the quality of their life. Locators are ideal for improving aesthetics and retention and they can be a perfect choice when an abutment tooth is removed or lost. This type of abutment is indicated to be used with partial dentures or overdentures which are retained in part or in whole by endosseous dental implants in the upper or lower jaw. But, it is good to remember that locator abutment is not appropriate when a totally rigid contact is required. All implant abutments or elements and also the metal instruments should be sterilized according to the standard clinical protocols. Another thing to consider is that locator males are single-use parts which when re-used may cause damage during removal or in most cases they may cause loss of retention for the denture. 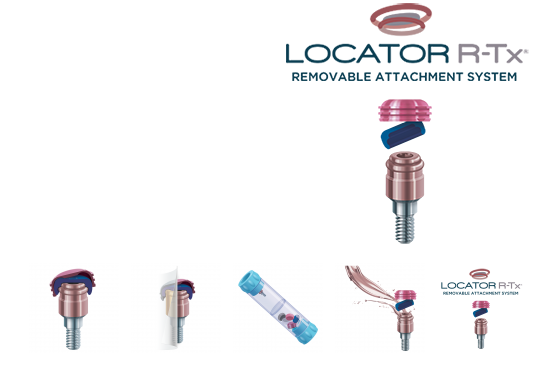 When it comes to locator abutments, when re-used they may also cause some problems especially they could have patient contamination or contain some particles which would affect the retention. The final result would be improper fit or inappropriate function which would lead to a loss of the retention of the denture. 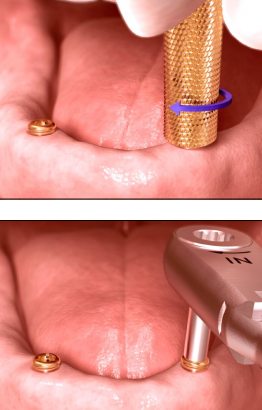 – Dual retention, outside and inside: This unique and innovative feature of the locator allows greater retention than any other attachment before. The greater surface area that ensures better retention combined with the inside and outside surfaces provides the long-lasting performance. 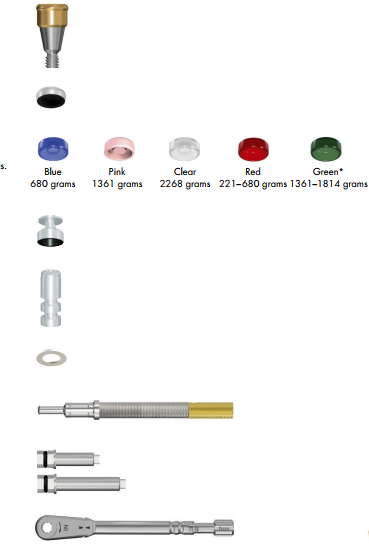 – Low vertical profile: The total height of this type of attachment for an externally hexed type of implant is 3.17 mm and for a non-hexed type of implant it is 2.73 mm. 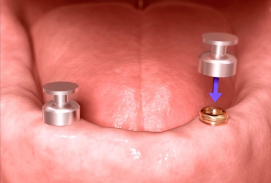 – Pivoting feature: The pivoting locator male has a special design which enables a resilient connection with the denture and without any negative result of losing retention. The nylon male part which is retentive, stay in contact with the other part more exactly with the female socket. Finally, the metal prosthesis cap has a full range of rotating movements over the male part. – Easy maintenance because the overdenture and the locator abutment have to be cleaned every day. – Easy and very simple insertion: Its self-locating design permits a patient easy seating of the denture without the necessity for exact alignment of the other attachment elements. It is very important to follow the dental professional instructions after the successful placement of the dental implant and the advanced locator abutment in order to not cause any irritations because it may affect the durability of the whole construction as well. In the first days after the procedure, the patients should rinse their mouth with mouthwash and then they may clean it with a soft-bristle toothbrush but very carefully. This way, they would help in the healing process. Another thing to keep in mind is that pain or discomfort may also occur, but in a relatively short period, they will disappear with the termination of the healing process. With the usage of the locator, a dental professional could offer to its patient a great implant-supported solution for its denture. All cases with specific angulation and also limited occlusal space could be easily improved with the locator. The height of the selected locator abutment needs to be based according to the highest position of the tissue when measured with the special instrument called Abutment Depth Gauge. This action is performed just to permit the retention groove to be at suitable supragingival height. The locator abutment should be inserted manually into the implant. The abutment should be seat manually utilizing the locator Abutment driver instrument from the locator care tool set. Torque the locator Abutment utilizing the special instrument called Locator Torque Wrench Bit accordingly accompanied with the Torque Wrench used for the final tightening. The dental professional should firmly attach the special component of the set more exactly, the Locator Abutment Pick-up to each of the Locator Abutments. The pick-up tool should establish stable friction retention. The impression from this situation should be taken in a specially customized tray with a specific elastomeric material for impressions. When the impression material is ready, the dental physician should remove the impression tray. Before sending the impression to the dental laboratory is has to be checked and classified as good one. When inspected, the dental professional should look for the black processing inserts and notice if they are clear and visible. If everything is okay, the impression should be well disinfected and ready to be sent to the proper dental laboratory. The dental technician should place the locator Abutment Replica into the locator Abutment Pick-ups. He should create a model which would serve as a working one with the Locator Abutment Replica and some stone material with high-quality. In this phase, the dental physician should position the spacer above each Locator Abutment Replica supplying primary soft tissue support and a great resilient condition. The dental worker should connect the Locator Processing Cap. Then it has to be processed and cured into the denture. After this, the processed prosthesis should be removed and the spacer should be discarded when the acrylic material has set. The acrylic material should be added as necessary. The dental physician should utilize a burr in order to remove the excessive acrylic and later polish the base of the prosthesis. The final denture together with the Locator Processing Cap should be sent to the dental clinician. For this phase, the dental clinician should use the Locator Insert Removal Tool for removing the back processing insert. The dental clinician should press the chosen locator and it should be inserted into the Processing Cap’s metal housing utilizing the Insert Seating Instrument. When all the procedures are done, the dental clinician should seat the dental prosthesis over the Locator Abutments. The prosthodontist should verify that the necessary retention is completely obtained. When it comes to the retention, gradual increasing is always the best solution and the most suitable recommendation is to start with the low-level retention. The great success of a long-lasting implant is definitely maintaining good oral health care habits. 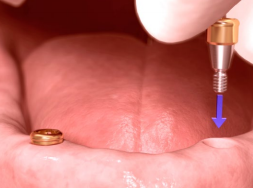 Patients have to be informed that the Locator Implant Abutment should be cleaned every day. They have to purchase a soft nylon bristle toothbrush and they have to teach how to polish and superfloss the abutments. The dental clinician would recommend a non-abrasive toothpaste or gel and also a rinsing mouthwash should be found in the oral health care kit. As an additional oral hygiene tool could be an irrigation system such as water floss just to maintain the Locator Abutment socket clean. Patients should not soak their dental prosthesis. Those people who clean their dentures this way, eat salads or spinach, and have some health problems such as acid reflux, should follow the instructions of their dental professional and brush the attachments with water and mild dish soap. This is especially helpful for the nylon attachments because it will keep them smooth and at the same time the solution would reduce the excessive particles on the implant abutments. Another great idea about checking the patient’s maintenance of the oral health care habits is to schedule an appointment every three to four months for cleanings and the evaluation of the implant condition. This way, the dental clinician would replace the nylon males if abrasive calculus is accumulated because if it is not cleaned it may provoke premature wear on the abutment. In some cases, the dental worker should check and notice if a reline procedure should be done to the denture. When the prosthesis is relined, it gives dentures great stability and at the same time reduces the accumulation of wear on the attachment. The most concerning area when implants are inserted in the patient’s mouth is the sulcus area. The dental clinician should use proper instruments for performing the scaling of the abutments. Plastic instruments are the first-line choice because metal instruments could leave scratches on the surface of the abutment. During the examination process, the dental professional should check if there are any signs of inflammation around the abutments. Another thing that should be examined is the implant mobility. The dental practitioner should utilize the locator Abutment Driver so he could become sure that the Locator Implant Abutment is well tight before dismissal. generation locator is the new and advanced Locator R-Tx Removable attachment system. This method offers progressive outline features, new and stronger system simplicity so dental clinicians could quickly realize the practical advantages of upgrading the existing Locator Abutment system. The new methodology of the all-in-one package gives the necessary elements which are needed for the specific case with only one part number. 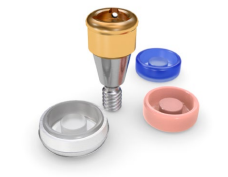 The convenient all-in-one Package contains Locator R-Tx Abutment, Retention Inserts (Zero Retention Insert- Gray, Low Retention Insert- Blue, Medium Retention Insert-Pink, and High retention Insert – Clear), Denture Attachment Housing with Black Processing Insert, and Block Out Spacer. This revolutionary system is great for both, the clinician and the patient. Looking forward to hearing from the manufacturers what would be their new invention.